The .45 Colt/.410 T/C Contender (top) is a remarkable tool for taking doves over decoys. Well, not quite, but handgun shotshells have come a long way and have greatly expanded the utility of that handgun on your hip. I’m sure creative handloaders had been cooking up shot-stacked “snake loads” for their revolvers for years, but in the early 1950s, Jim Harvey, head of Lakeville Arms in Lakeville, Connecticut, really brought the shot revolver into a state of perfection. Using large-framed revolvers, like the Colt New Service chambered in .45 Colt, Harvey reamed out the barrel to remove the rifling, uniformed the chambers and screwed a 1-inch external choke tube with a 0.010-inch degree-of-constriction on the end of the barrel. His shotshell load in a .45 Colt case consisted of 5-grains of Bullseye under approximately 135 pellets of No. 7-1/2 shot. His proprietary overshot wad was made of zinc to minimize leading. It is said the 25-yard patterns delivered by his remarkable design bordered on the efficiency and effectiveness of a 2-1/2-inch .410 shell. Ah, but it was too innovative to last. In 1956, the US Treasury Department decided Lakeville Arms shot revolvers were sawed-off shotguns under the National Firearms Act (NFA) and could not be sold without registering them with a $200 tax stamp. The total cost of the revolver plus Harvey’s gunsmithing modifications plus the $200 tax stamp simply became prohibitive to the average American shooter in the 1950s, when new Model 70 Winchesters retailed for $126.50 and a new S&W .45 1950 Army sold for $70.50, but help was on the way. CCI handgun shotshells are available in 8 different calibers, and come in a variety of shot sizes. The new Big 4 shot capsules are red-colored, not blue, for quick visual identification. Speer really lead the charge by offering handloaders empty shot capsules in both .38 and .44 calibers. All the handloader had to do was select a shot size, fill the capsule, press in a plastic lid to seal the capsule, seat the encased shot in a shell and fire away. 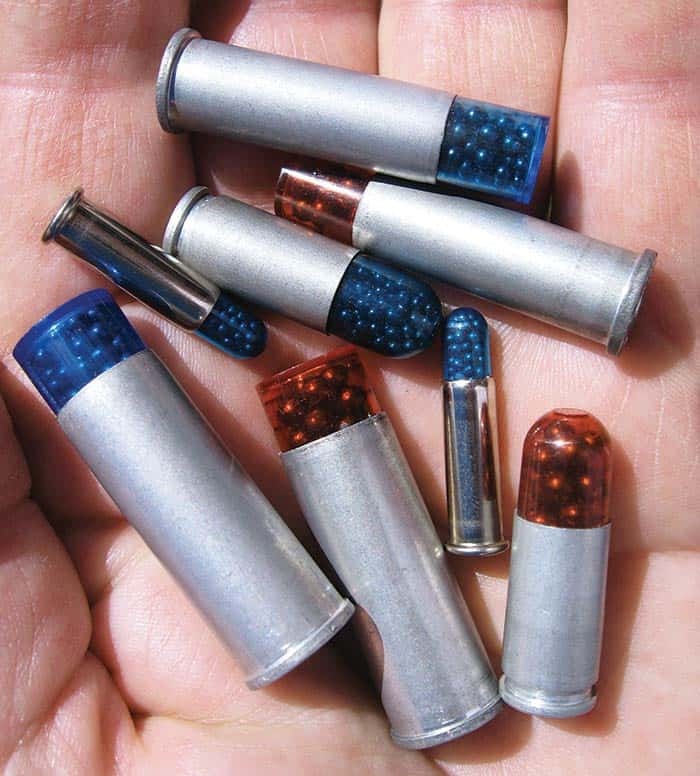 Shortly after Speer’s introductions, a company called Remco began offering prefilled capsules to handloaders in an even broader range of handgun calibers. Did they work? In a fashion, they did. The early manufacturing challenge was coming up with a plastic the rifling could uniformly cut through and fracture releasing the pellets in a fairly consistent pattern as they exited the barrel, otherwise the capsule-enclosed payload would drift right or left according to the direction of the rifling twist. The capsule protected the lead shot from the rifling, but also left (and still does) plastic fouling in the bore. Speer’s sister company CCI then took the lead in developing a complete line of shotshells for handgunners. If I remember correctly, first out of the starting gate was their .22 Long Rifle shot cartridge. For decades, we had been conditioned to the industry’s, standard, rimfire, “scattergun cartridge,” consisting of a Long Rifle case filled with a dollop of No. 12 shot, sealed in with a heavy, folded crimp formed by the end of the case mouth. It was an exotic looking round, but performed miserably. The No. 12 shot was deformed by having to break through the metallic crimp and then further mutilated by contact with the rifling, resulting in sketchy patterns at 6-feet and a thoroughly leaded bore. CCI’s new product was a miracle. Rather than crimp the case mouth, CCI developed a small, plastic shot capsule looking ever so much like a blue vitamin pill, and it worked! Suddenly our .22’s were throwing death-dealing patterns on mice and rats around the barn. CCI quickly extended the successful loading to the .22 Win Mag. Some of the arms manufacturers even turned out a few smoothbore rimfire long guns. The major handgun calibers were soon to follow. CCI selected No. 9 shot for the first generation of .38 Special, .44 Magnum (.44 Special came much later), .45 ACP and .45 Colt shotshells. When the 9mm became popular, CCI added it to the line, but because of its limited case capacity, No. 12 shot was substituted for No. 9’s. Standard velocities for the shot payloads were pretty snappy, ranging from 1,000 to 1,450 fps. Patterns were effective from 12 to 15 feet. We were just humming along when CCI came up with an alternative series of loads utilizing No. 4 shot. The T/C Contender .45/.410 performs like a full-size shotgun at 25 yards. T/C’s unique choke really delivers. Holt tested the CCI shot cartridges in (left to right) .38 Special and 9mm at 12 feet, and .45 Colt at 15 feet. CCI’s red-capsuled “Big 4” was fired onto the left hand targets, and the smaller shot in the blue capsules on the right hand targets. Going from No. 9’s to No. 4’s is a big jump. Branded as the “BIG 4” and sporting red-colored, rather than blue shot capsules, the new loadings were characterized as providing the energy and patterns “to take down larger pests at longer distances.” Hmm. Interestingly, the Big 4 for .44’s only comes in the .44 Magnum. Only No. 9 shot is loaded in the .44 Special. In breaking down the Big 4 loads on hand, I counted the number of No. 4 pellets in each caliber capsule and then fired the shells side-by-side with regular No. 9 shotshells to compare patterning results. And the story would not be complete unless I added in my favorite dove hunting 10-inch, T/C Contender .45 Colt/. 410 as a basis of comparison. The barrel is fully rifled for the .45 Colt cartridge but the chamber accepts a 3-inch .410 shell. The secret to the system is a short, straight-rifled removable choke tube. The choke tube stops the shot cup from rotating as it leaves the muzzle, thus delivering a well-centered pattern. The 25-yard pattern of 7-1/2 shot speaks for itself. Deadly, if you’re lying in the grass a few steps from your dove decoys! Speaking of patterns, I was very impressed with the .22 Long Rifle pattern at 12 feet. It’s a real rat killer. The No. 4 and No. 9 (No. 12 in the case of the 9mm) comparison targets are very educational. Although the No. 4 pellet hits in each case would have probably put the subject rodent down, I still lean toward the density of the No. 9 and No. 12 shot patterns, especially if the target might be moving. And there you have it. CCI can put a neat short-range shotgun in your holster. In my experience, a range of no more than 12–15 feet, depending upon caliber, is ideal for these light payloads of fine shot. On the other hand, if you get really serious about having a shotgun in your holster, there’s always the S&W Governor and the Taurus Judge to consider with their cylinders stuffed full with .410 shotshells. Those are serious, hip-hugging scatterguns. I might add I carry one shot cartridge in the cylinder of any wheelgun I carry in the field. Sequentially, it’s loaded as the last round, not the first. I want the first 4 or 5 rounds out of my handgun to be solid. If I do encounter a snake problem or begin jumping field rodents, I always have plenty of time to rotate that little shotshell into its proper position. Purchase A PDF Download Of The GUNS Magazine February 2018 Issue Now!